Problem: This home had sagging floors and high humidity due to an exposed dirt floor. Solution: Install a vapor barrier (CleanSpace) to isolate the home from the earth. Dig and pour new concrete footings and install steel support posts (jacks) that can be adjusted over time to lift the home back up. Install a high-performance dehumidifier. Problem: This tight, uncomfortable and ugly access adds no value or practicality to the home. Solution: Install a well (steel or vinyl) with a removable vinyl door. This is the EverLast Door. Only doors below grade need a well. Problem: These home owners were experiencing water penetrating into their unfinished basement. Their sump pump system was older, unreliable and contributing to an unhealthy level of humidity in the home. Solution: Our team waterproofed the problematic walls, installed the ThermalDry® Wall system (which protects the basement from moisture and water as it passes through foundation walls – it serves as both a vapor barrier and as a way to redirect leaking water into the new drainage system). We completed the basement with the reliable and industry leading TripleSafe™ sump pump system. This before and after is a great example of how all of our products work together for a dry basement. With regular maintenance, these home owners will never have basement water problems again! We are looking to install a battery powered or water powered back up for our sump pump. It's a raised ranch, never had a flood but want to avoid possible problems in the future. Please, give me a price range for different solutions and suggest what might work the best for us. Thank you. Our concern is that the floors are sinking and uneven in every room. This issue seems to have effected the ceiling and the 2nd floor of the house. It is a century home so we are not sure of how well it can be fixed. My home is 100 yrs old and the floors are sagging very bad.i have a crawl space..
Serious cracking and bowing of the foundation wall which is above grade. We conducted a 6-month radon test in the basement and level was 300Bq/m3. House is a detached single-family home built in 1992. 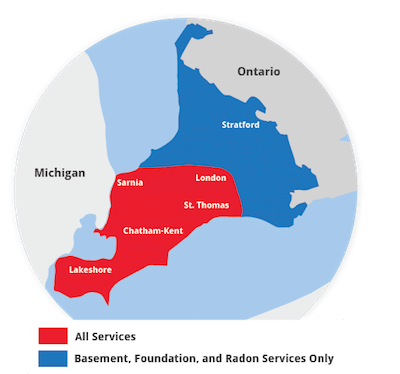 We will need a quote for the work needed to reduce the radon gas. House is 30 min south of Windsor, ON. After having a 15' x 16' concrete slab removed from the back corner of the house after having it removed I'm pretty sure out house sank in that corner and we need a free estimate. Hi, I'm looking for a quote to have a structural beam (15-20' long) replaced in my crawlspace. Very satisfied. Tom knew his business. Efficient, extremely nice and informative. Thank-you for a job well done. The whole experience from start to finish was seamless. Other companies from whom I want work done could take a lesson from Advanced Basement Systems. I am the only one around who didn't get flooded. The guys at Advanced Basement Systems were awesome!! Arrived as scheduled, job was done in 4 hours and left the site clean. Professional and efficient. My wife being a lung cancer survivor for four years really appreciates the peace of mind knowing the results that were achieved by installing the radon mitigation system. Very satisfied. Would feel free to recommend you to other homeowners. JUSTIN FYSH AND TEAM DID A NICE JOB WITH INSTALLATION AND CLEANUP. All the work that we have had done has been completed efficiently & professionally. When the first work was done the men worked diligently & kept the area as clean as possible causing as little dust to enter the main part of the house. The crew is made of men who are pleasant & you are glad to have working for you. Never feel uncomfortable. A plus for females & seniors. Keep,up the quality of the work & the work ethics of the employees. keep up your fine work Joel. We appreciate Joel working in our home. In fact prefer only to have him. We trust his work ethic & his overall concerns shown for the care of our house . Your crew was vary polite and efficient. I hope Bryan's contact with our property manager results in future work on these 239 units. Installation crew very mindful of keeping inconveniences (e.g. removal and reinstall of hot water heater, controlling dust) to a minimum. Also very courteous. C. S. Old West Ave.
"JUSTIN FYSH AND TEAM DID A NICE JOB WITH INSTALLATION AND..."
We not only adhere to the highest industry standards, we strive to be the industry leader in the home improvement related services we provide. We also use state-of-the-art products and technology which are designed to fix your home. We are the authorized Basement Systems dealer in Amherstburg, ON. New footings and support posts (jacks) are holding up the weight of this house. The CleanSpace Liner provides many benefits such as aesthetic appeal, dry storage and added light. Our support columns are patented. We call them Smart Jacks. They are galvanized, can hold 60000lbs and are fully adjustable. The access hole was much smaller, so we enlarged it. The holes are created and the door is cut custom. The fasteners hold the door in place and are easy to remove when access is required. Need slab jacking in front of garage, side of garage and infront of front steps. Want the plug for concrete to match the dyed concrete. Would like radon testing done and quote on cost of mitigation system. Water leaks into my ground floor laundry every time we have a heavy rain. Appears to be coming from exterior wall.